The Peroneus Longus is the longer, bigger, and much more superficial of both muscles of the lateral compartment. It’s bipennate in the upper part and unipennate in the lower part. upper two third of the lateral surface of the shaft of fibula and adjacent outermost layer of the head of the tibia. anterior and posterior intermuscular septa of the leg and deep fascia overlying it. The muscle converges below to create a long tendon which is located superficial to the tendon of the peroneus brevis and lodges itself together with the tendon of peroneus brevis into a groove behind the lateral malleolus underneath the superior peroneal retinaculum. After appearing from beneath this retinaculum, the tendon of peroneus longus enters downward and forwards via the inferior pulley of the inferior peroneal retinaculum below the peroneal trochlea of the calcaneus. On reaching the cuboid bone, the tendon longus alters its direction for the 2nd time to go through the osseofibrous tunnel on the plantar surface of the cuboid. It then crosses the sole of the foot obliquely from lateral to medial side to be added in the inferolateral surface of the base of the very first metatarsal bone and the adjacent part of the medial cuneiform. The tendon includes a sesamoid bone where it binds around the calcaneus. 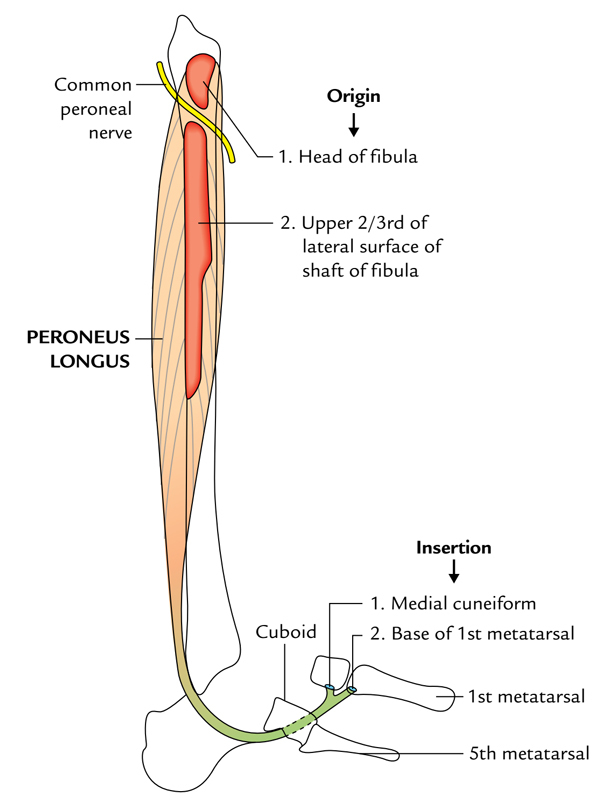 The peroneus longus is provided by the superficial peroneal nerve. It’s the leader evertor of the foot. It keeps the lateral longitudinal arch. It also preserves the transverse arches of the foot. It’s a fusiform bipennate muscle and is located deep to the peroneus longus. As its name signifies, it’s shorter than its partner (peroneus longus) in the lateral compartment. Lower 2-third of the lateral surface of the shaft of the fibula. Anterior and posterior intermuscular septa of the leg. The muscle converges to create a tendon which enters behind the lateral malleolus underneath the superior peronealretinaculum. Here it is located in front of the peroneus longus in a common synovial sheath. Afterward it enters downward and forwards above the peroneal trochlea of the calcaneus underneath the superior pulley of the inferior peroneal retinaculum. Here it’s enclosed in a different synovial sheath. Ultimately it enters forward and laterally to be added on to the tubercle on the lateral side of the base of the fifth metatarsal. 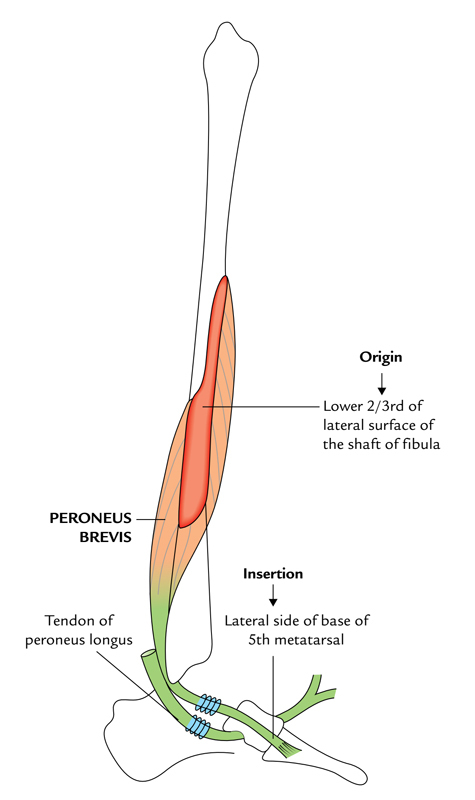 The peroneus brevis muscle is provided by the superficial peroneal nerve. It’s the evertor of the foot. It preserves the lateral longitudinal arch. Clinical testing of peroneus longus and brevis. Firmly evert the foot of patient, against resisting; if normal, the tendons of those muscles can be viewed and palpated inferior to the lateral malleolus. Deformity foot on account of overactivity of invertor and evertor muscles of the foot. Following an injury to the superficial peroneal nerve, the paralysis of the peroneal muscles and related overactivity of the invertor muscles of the foot creates a deformity of foot referred to as talipes varus. The overactivity of peroneal muscles following paralysis of the anterior tibial muscles (invertors of foot) creates a deformity of foot named talipes valgus.